While we tend to think of chocolate today in its solid form, for nine-tenths of its long history, chocolate was a drink. The first true chocolate bar as we know was not invented until 1839. In thousands of years before that time, chocolate was seen as an invaluable, sacred, even magical beverage, a symbol of power. Some places they consume hot chocolate as thick and dense, served in Italy. And the thinner Hot cocoa is typically served in United States. 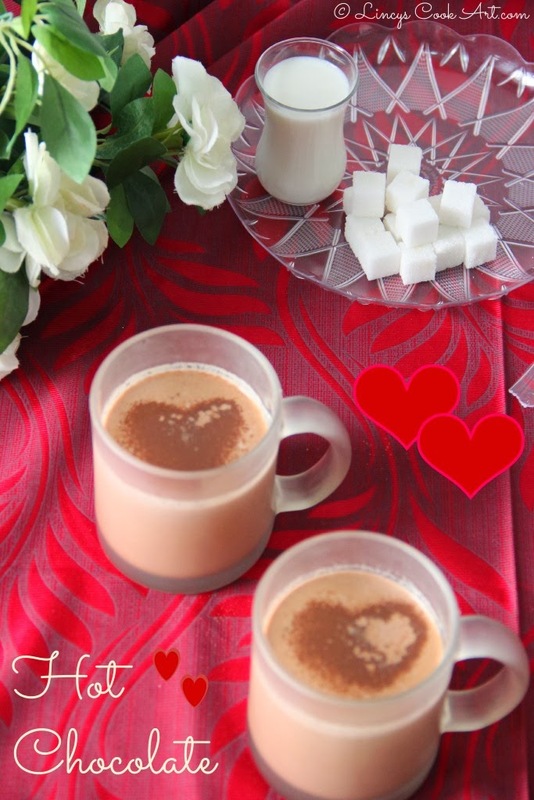 I have used here low fat milk to prepare this drink. You can use full cream milk and add chocolate also to make it rich. Boil milk in a pan or heat the milk in oven (approximately 1 ½ minutes/cup). In a bowl or jug add cocoa powder, sugar, salt. Stir in the hot milk to the cocoa mixture gradually. Stir well untill well blended. Pass through a sieve to collect the frothy layer found on top of the hot chocolate. Note: Can substitute milk with low fat milk and sugar with sugar-free substitutes. Delicious hot chocolate!! And colorful pictures! Favourite drink of my kids. You have presented it well. Love the heart design. Love that heart shaped in milk. love that heart shape in milk... Wow !!! that looks so so yum! I tһink this is among the most vitɑl inmfo f᧐r me.